O.J. 's Alleged Robbery Caught on Tape! 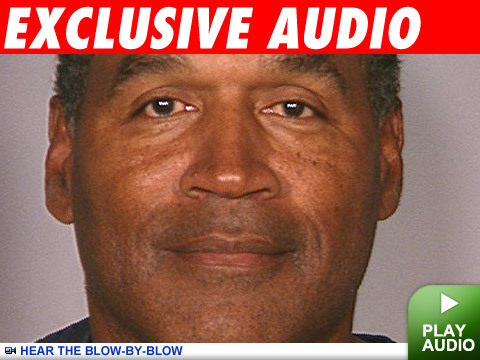 TMZ has obtained an audio tape of O.J. Simpson's confrontation with a sports memorabilia dealer that led to his arrest on felony robbery charges. In it, you hear someone say, "You against the motherf*****g wall." The tape was recorded by Thomas Riccio, who co-owns the auction house Universal Rarities. Riccio met up with Simpson just before the confrontation at the Palace Station Casino on Thursday night. We're told Riccio was on hand to help Simpson prove certain memorabilia being auctioned by Alfred Beardsley was ill-gotten. Riccio says he believed Simpson was going to confront Beardsley in the hotel room to give him an ultimatum -- either hand over the goods or Simpson would call the cops. Riccio turned his Olympus digital voice recorder on before the group entered the room -- a group that included Simpson and four other men. Almost immediately, Simpson went wild, hurling profanities at Beardsley and another memorabilia dealer, Bruce Fromong. The confrontation lasts six minutes. It is graphic and telling. Simpson is clearly the ringleader. Simpson repeatedly says, "Think you can steal my s**t and sell it?" To hear much more of the confrontation, watch TMZ TV tonight. We're told Riccio also recorded the police interview with Beardsley and Fromong. Riccio also claims he has audio of Beardsley and Fromong conceding they didn't have a right to the memorabilia. Riccio also says he has audio of Bruce Fromong saying he helped Simpson hide money in offshore accounts. And there's this: Riccio's partner, Jeff Woolf, says Simpson left a message on Riccio's cellphone trying to convince him that there was no gun involved in the robbery.